Artwork credit: Gustave Doré, Inferno, Canto 3.9; obtained from Wikimedia Commons. 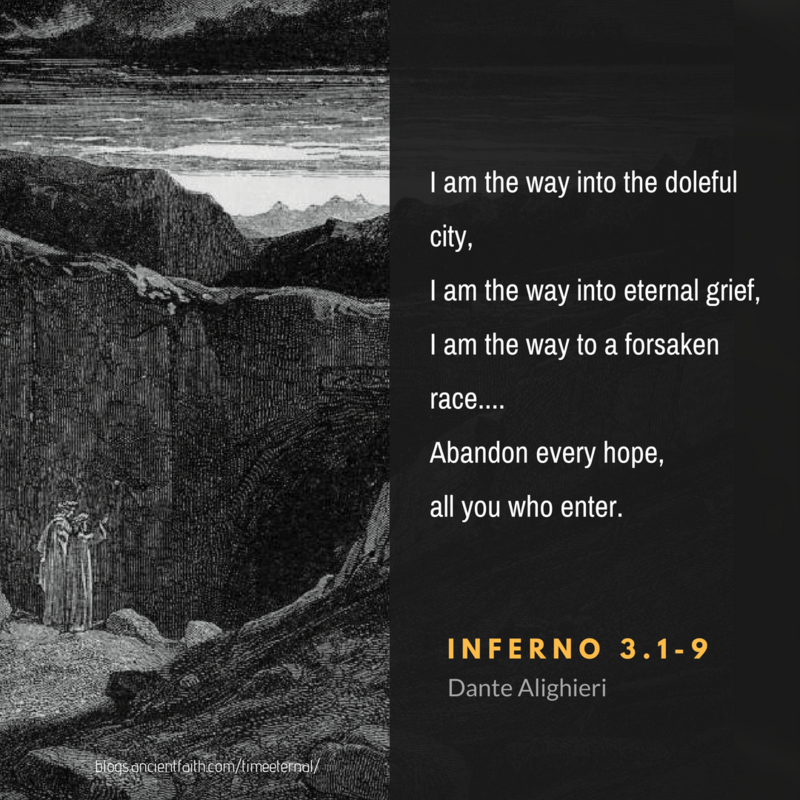 Dante’s Divine Comedy begins with the Pilgrim “midway along the journey of our life” (Inferno 1:1), on the on brink of despair. When help comes in the form of the Poet Virgil, he first brings the Pilgrim to the gates of Hell. It’s a very hopeless note on which to begin. However, the Divine Comedy is anything but a hopeless book; it’s the story of the Pilgrim’s journey through not just Hell but also Purgatory and Paradise, all undertaken for the restoration of his hope and his salvation. Dante manages to take that initial despair and transform it into something hopeful and beautiful, culminating when the Pilgrim beholds God. In this post, I focus specifically on how hope relates to forward motion because for Dante, moving forward is an essential characteristic of hope; it’s reflected in the hierarchy of the afterlife as well as in the punishments, penances, and praises of the souls therein. To ignore the forward movement of hope is to ignore what makes hope applicable in the here and now, for both Dante and his readers. To understand the role of forward-looking hope in the Divine Comedy, it’s important to understand how it is that hope looks forward. Dante defines hope as the “sure expectancy of future bliss” (Paradise 25:67). 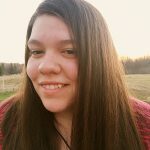 Hope says “I can change,” trusting in God. One of the requirements for hope is time; if there is no time, there is no future to hope in. 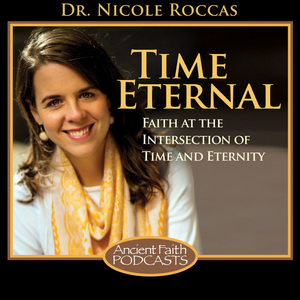 It’s helpful to think about our time on earth as moving toward the light at the end of the tunnel. We move toward something outside of ourselves, God, despite the present darkness. Because hope requires movement, it necessarily requires actions. In Dante’s depiction of Paradise, St. James, who is famous for writing about how faith without works is dead, questions the Pilgrim about hope. This is no coincidence. Hope, like faith, is an action and not just an internal matter; it requires repentance. To truly be hopeful, we must keep turning back to God and moving toward the light. Although hope is dependant on actions, it’s fortunately not a matter of emotions. Even if we find ourselves like David the psalmist who cried “How long wilt thou forget me, O Lord? Forever?” (Ps. 13:1) we can still have the kind of hope David wrote about a few lines later: “But I have trusted in Thy mercy; my heart shall rejoice in Thy salvation” (Ps. 13:5). To be hopeful, we need both a future to move toward and to keep moving toward that future. Hell is the antithesis of hope; it serves to show where lack of time, motion, and repentance lead. Here, the reader finds souls who have given up, turned away from God and in turn have been served divine justice. Because the Pilgrim begins on the brink of despair, it is fitting that Dante begins by showing where this road leads. Those in Hell refused to act in accordance with hope and repent so now it’s lost to them forever. It’s as if the light at the end of the tunnel was taken away, leaving no point in even stumbling around trying to find something that’s not there. Nothing changes, ever. This sameness is reflected in the structure of Hell itself. Moving into Purgatory, the Pilgrim has reached what is possibly the most hopeful place in the afterlife. 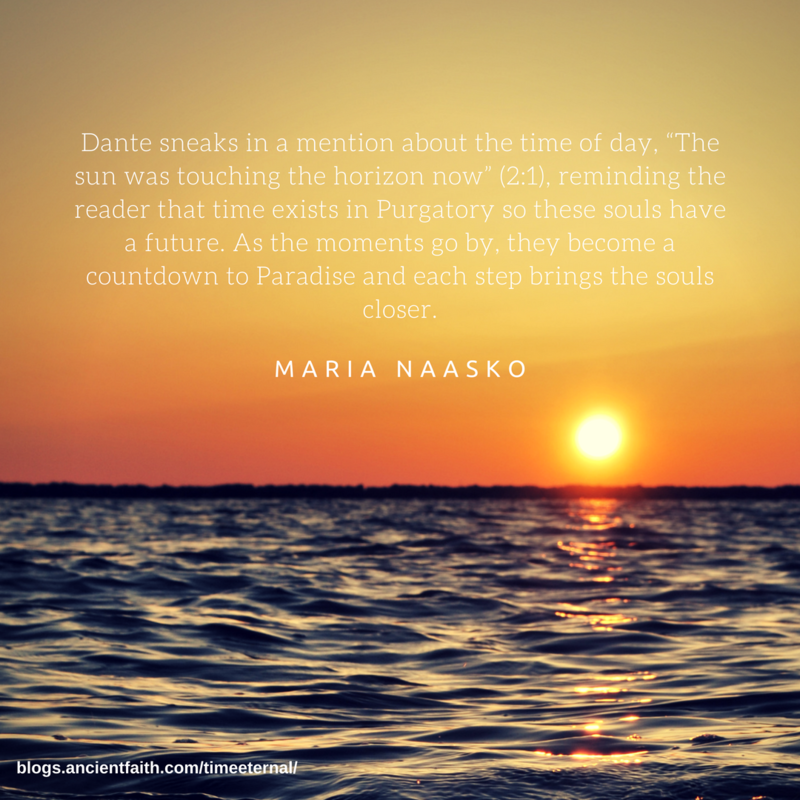 Almost immediately, Dante sneaks in a mention about the time of day, “The sun was touching the horizon now” (2:1), reminding the reader that time exists in Purgatory so these souls have a future. As the moments go by, they become a countdown to Paradise and each step brings the souls closer. Like Hell, Purgatory is composed of different terraces, each one devoted to a specific sin. However, the souls here progress up terraces rather than staying in the same one forever. The progress is slow yet constant. Although the overall feeling of Purgatory is much brighter and hopeful, the souls here still struggle immensely. Some of the penances seem to rival those in Hell. The proud are bowed down under the weight of immeasurably heavy stones, “even the most patient of them all seemed through his tears to say: ‘I can’t go on!’” (10:138-139). It’s a feeling probably all too familiar to Dante’s readers. Often, we find ourselves struggling to bear our own stones and feeling like we cannot possibly go another step yet like the souls in Purgatory, we are called to move forward. What separates this temporal struggle from the labors in Hell is that this is a hopeful struggle. The journey is finite, and it’s accompanied by prayer, which is nothing less than speaking with God. “Hallowed be Thy name, hallowed Thy Power, by Thy creatures as it behooves us… to render thanks for Thy sweet effluence” (11: 1-3), pray the proud, the same ones collapsing from the weight of their stones. They are moving forward with their words and actions. When the souls in Purgatory finally reach Paradise, they have made it to the apotheosis of hope, the “One Who moves all things” (1:1). All souls here have reached their mark, all are joined with God. Dante stops making references to time and days which is a sneaky way of reminding the reader that Paradise is outside of time and thus has no future. If one assumes that this excludes hope, one would be correct; hope isn’t necessary because it’s the boat that ferries us to Paradise. Once we have reached Paradise, we get off the boat and leave it behind—why would we need a boat on dry land? Once again, Dante includes fixed places–this time stars–rather than souls moving up and down different levels. At first glance, Paradise might seem to have a sameness not unlike Hell. The difference is that in Hell, all the souls have is a past but in Paradise, everything exists in one present, an eternal moment that just is. God is Who Is and His creations in Paradise get to share in that same state of the present. Obviously, the way Dante writes Paradise it’s not one continuous present moment. Seats in the Celestial Rose aren’t yet filled, events happen in a chronological order, and some of the blessed even speak of future events on earth as in the future. This is because the Pilgrim exists in time; like us, he can only understand things as happening with a past, present, and future. Furthermore, Dante is limited by those same restraints. Although covering the eternal moment, it’s forced to describe it with time due to the limits of human reasoning. Dante’s Divine Comedy has remained so widely read for hundreds of years because it carries a message of hope. Hope isn’t the emotional feeling of cheer and smiles but rather moving forward in little ways—taking up our cross and walking. Every time we chose to move forward toward God—whether that be by simply getting out of bed in the morning or by completing some difficult labor—we chose hope. Like the Pilgrim, we face an uncertain future, but this need not be a cause for despair; each step brings us closer to the eternal rest where there is no sorrow. 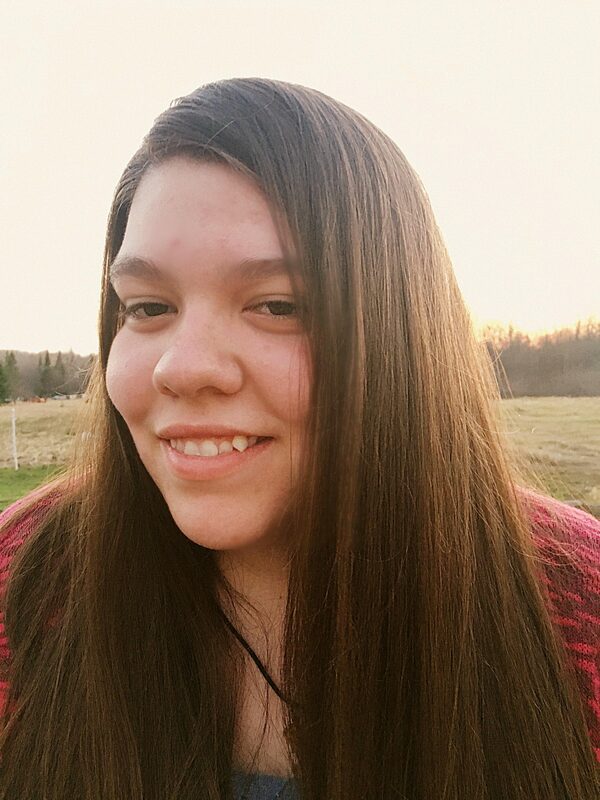 Maria Naasko is a very recent high school graduate who attends Ss. Sergius and Herman of Valaam monastery, where her dad is the deacon. She likes to make things, whether that be by crocheting, writing, or baking. She lives on a small farm with her family where they raise sheep, beef, and poultry. (Don’t tell the beef steer but the sheep are definitely her favorite.) She blogs about crochet at stuckwithewe.blogspot.com. This is awesome! I enjoyed it so much.